My attempt, not verified yet. Something that would really help us is if you mesure the voltages of v+1, v+2, v+3 and the pin 3 of IC1. I think that D1, D3, D4 and D8 are all 2,2uf caps. There is a component that connects the pin 2 of the input potentiometer to de ground, is it R1? R7 and C2 are the pre-emphasis rc filter and R11 and C14 is the de-emphasis, it shapes the tone and I believe that it boosts some mids or low-mids. EddieTavares wrote: Something that would really help us is if you mesure the voltages of v+1, v+2, v+3 and the pin 3 of IC1. I think R19 should be 1k not 10k, then V2 is around 6V. - There is a small capacitor that connects pin 5 and 7 that is not listed in the schematic, maybe 100 pf. - C21 at 100nf mutes the signal, I tried smaller values like 10n but it makes the lm380 oscillate, values even smaller or makes it oscillate or does not affect the tone but seems to sound a little bit noisier. - C18 should be Ok but when I change it to higher values it sounds fatter what can be better to Strat like guitars. Maybe other values are incorrect but I believe that are all Ok. I can't compare side by side but I think that it work alike, It's a clean booster that makes easier to use the volume control as gain control i addiction it makes the picking more "gain-responsible" much more than other overdrive or booster that I've played. I've tried to measure the capacitors that are not marked but it's not accurate. 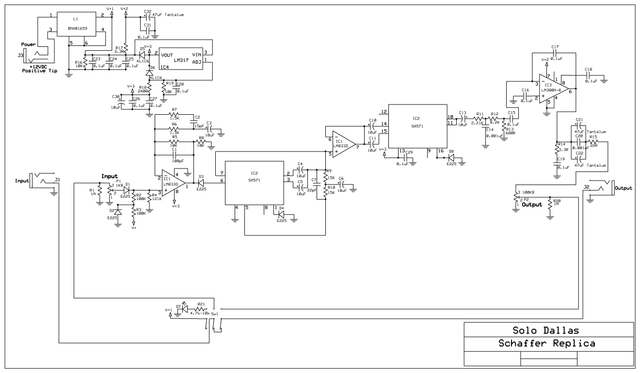 - C7 is probably 100pF like on the other schematic. - C1 is probably 15pF. patricef, thank you for your job!!! Capacimeters does not mesure efficiently when a capacitor is connected in parallel with a resistor or other component because it uses CA signal to do it, but don't worry, don't try to remove those caps to mesure if you are not sure that you can do it without damages. I think that now we have traced approximately 95% or more. - C1 I tried several values to between 100pf and 1uf and I am almost sure that C1 is 100n. - C18 if you tried to mesure C18 in the same way probably 4.7nf is wrong. This two C1 and C18 caps are in the pre/de emphasis CR circuits, they are important but in the earlier units there is no C1 and R2 what makes me think that the earlier units where less brighter or they use used other method to emphasizes highs in the compression half. The other thing that I have thinking about is that in Rotagilla's schematic there is a lm317 to reduce the voltage that feeds the op amp and compander and in patricef's schematic there is twoo "spare" resistors r15 and r17 they probably are a voltage divider what feeds at the max 6v all the circuit but the lm380. I made some my drawing for this project but there is some incongruity with this PCB picture and schematic. There is no R2 C2 components on this PCB, also I traced only from top side and I don't have some values. Work is still in process so the corrections are on the way. This pcb founded in the Solo Dallas website is probably one prototype, R2, C2 and other missing components just apears in the comercial units. OK, I made components drawing using this picture.